﻿How 'bout some raves . . .
Art in the Wilds is an outdoor, juried Fine Arts Show happening annually (since 2006) in Kane, Pennsylvania's Evergreen Park during the 4th weekend in June. Organized and managed by a dedicated group of art lovers, the show is applauded by both visitors and participating artists as one of the best shows in the region. As a 501c3 non-profit organization all donations to Art in the Wilds are tax deductible. Find more information at artinthewilds.org. Under the shade of some fine old oak, black cherry, and hemlock trees a group of artists and artisans assemble to display their work. It’s the fourth full weekend in June and the natural setting and friendly small town atmosphere of Kane, Pennsylvania, have lured the artists to Evergreen Park for the Annual Art in the Wilds outdoor show. Located in the northern Alleghenies of Pennsylvania, Art in the Wilds attracts visitors from a wide radius who have discovered that the show is an ideal setting to browse the work of the creative artists and artisans. To get to Kane, PA, visitors travel through beautiful hardwood forests, enjoying the lushness of June in the Pennsylvania Wilds. Free parking around the perimeter of the park invites visitors to step out and stroll the artists’ booths. Art in the Wilds is a juried art show. To be accepted into the show, artists must go through an application process. Submitted photographs of their recent work are juried on overall impact, originality, presentation, design, and mastering of their chosen technique. All work must be the artist’s original creations, made by hand. The artists displaying their work come primarily from Pennsylvania and neighboring states in the mid-Atlantic region. They bring a variety of creative media including acrylic, oil, and watercolor painting, drawing, pastels, woodturning and woodworking, jewelry, photography, ceramics, glass, fiber arts, leather and metal sculpture. The Art in the Wilds show is organized by a team of committee members under the leadership of co-founder Marilyn Blackmore. The all-volunteer show organizers work hard to represent quality artwork and a balance of the different creative media to ensure a tantalizing shopping experience. The committee works year round to set dates, secure sponsors, jury the artists, produce marketing materials, and recruit vendors. Local sponsors support advertising and marketing efforts. 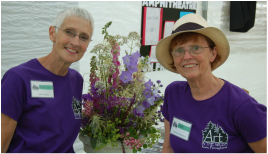 The community welcomes the visitors during the show weekend and the artists and visitors appreciate a cadre of on-site volunteers. The friendly atmosphere of the Kane community, along with the quality of the work being exhibited, has contributed to the growth of the show which began in 2006. Sitting on a porch on a spring evening in 2006, the Art in the Wilds show began as a discussion amongst friends. Wouldn’t it be great to make Kane a destination for fine artwork? Co-founders David and Marilyn Blackmore knew that there was already interest in the area for the arts. Kane’s location nestled in the state-designated “Pennsylvania Wilds” region produced the name of the show. After researching other art shows and interviewing artists and show organizers, a committee of people with specific skills was put into action. With the goal to expand the role of the arts in our rural communities, Art in the Wilds has, from the beginning, placed a strong emphasis on showcasing quality work. The Art in the Wilds show is held every year, during the fourth full weekend of June 10 AM to 5 PM, Saturday and Sunday. Food vendors are available on site. Regrettably, no dogs are allowed in the park. They will be asked to leave! Art in the Wilds is a 501(c)3 organization. Donations are always welcome!